I have finally come up for a breath. I have been working on wall hangings for my solo exhibition and working late at Whitireia in my studio or coming home and sewing until late in the evening. Over the next 6 weeks, there will be a whole series of Whitireia graduating student shows on in Wellington. I will try to put as many as possible on this blog as I find out the dates. I'll be setting up the show on Friday 13th - is that a good thing? Then I am teaching classes in machine quilting and printing on fabric the weekend of 14-15th for Pinestream Quilters (Upper Hutt, NZ) so I need to be finished ahead of time not working at the last minute. There are spaces in the classes, and if anyone wants to join in, contact me and I will forward your email to the organiser. I'm now half-way through making the pieces. They are 1.5m across and 2metres long. They are based on the Willow pattern plate and start as 'white on white' and quite see-through. Each has a scene on it and each day a new one will be dyed - vertically! Here is the photo which is going on my poster and in the advertising. I don't have an image of the actual wallhangings which will be in the exhibition , don't want to give the game away! This is actually the picture of the prototype. Above each hanging is a shelf of cups, dye drips down a thread and percolates slowly through the scene, following stitching lines and applique areas. The theme is environmental. 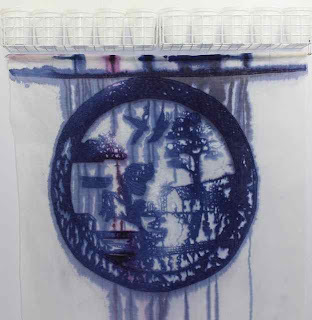 I have been researching dye pollution, water useage in the textile industry and consumerism. The first research on dye pollution was about China, hence the willow plate shape. However I soon discovered that many other countries have problems with water quality due to dyes being dumped straight into the rivers. Demand for cheap clothing often means that corners get cut with dyeing processes and water treatment. In New Zealand we don't really have any textile mills anymore, we rely on importing our fabrics from overseas. So we can stay 'clean and green' and somewhere 'Out of Sight: Out of Mind' gets polluted instead. However is is all tourist propaganda - our streams and rivers are polluted by dairy farming and run off from roads and although we wouldn't put up with our rivers turning bright red/turquoise/pink, there is plenty of research to say that we have water quality issues too. In fact - in Friday's Dompost newspaper, front page news was about water quality in Wellington and it wasn't pretty. The title was chosen because even though I know that a lot of the processes for producing textiles (particularly cotton) are toxic and cause massive environmental issues, I still love textiles. The conclusion I have come to is - I will try to use fabric I already have in stock or recycle used textiles if I possibly can. If not - then I will try to use every scrap of the new stuff with no wasteage and make things that can be upcycled if necessary (I once made 3 of my quilts into one big coat). 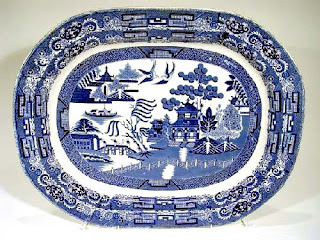 For those who don't know the Willow Pattern plate, blue and white china was being imported into England from China and people had whole collections of it. In 1790 imports stopped. As pieces of the Chinese china got broken, people needed replacement pieces and Thomas Minton designed a plate which had features taken from lots of different original plates. The process of making transferware was developed around the same time and eventually a large number of potteries started making the Willow Pattern china using transfers. It is still made today. Here is an image of a Willow Pattern plate (a.k.a Blue Willow) similar to one my Grandmother had which has been passed down in our family. The rumour is that they were given to families who had more than 12 children during Victoria's reign. However, I can't remember who told me this and can find nothing on-line which says anything like that. I'll try to update the blog daily till after the show. Next I have to complete my poster, a sign for the wall, invitations to the opening (if you are Wellington local just contact me and I'd be happy to send you a copy). Now I have to go and make stuff!